Father Of The Bride Tour! The indie four piece are back out on tour, bringing with them the witty songs, sartorial elegance and accessible style that makes them continually popular. 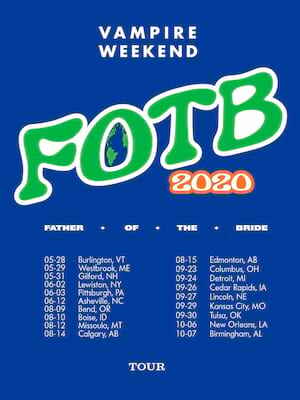 This year sees them hitting the North American road in support of their fourth album, Father Of The Bride. The band will be kicking things off in Toronto in June and running until October where they'll conclude their event in Denver. 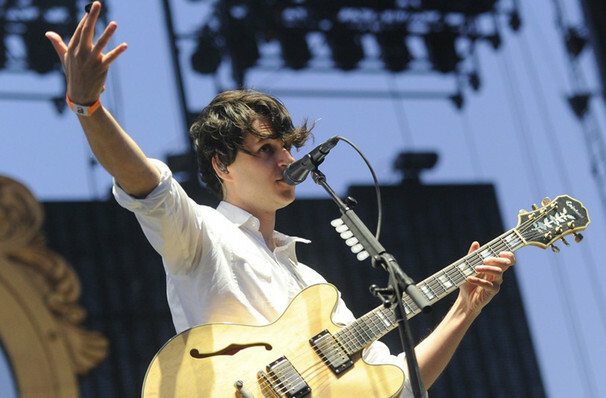 Formed in 2006, the band consists of lead vocalist and guitarist Ezra Koenig, multi-instrumentalist Rostam Batmanglij, drummer Chris Thomson and bassist Chris Baio. In 2008, they released their self-titled album which went on to receive critical acclaim and included singles 'Mansard Roof', 'Oxford Comma' and 'The Kids Don't Stand A Chance'. Folliwng 2013's Modern Vampires of the City, their upcoming album, Father Of The Bride, is set to be released later this year and marks the bands first release in nearly six years. The first single's off the album have only very recently been released 'Harmony Hall' and '2021', but it is said that the album will feature an incredible 18 tracks! Sound good to you? Share this page on social media and let your friends know about Vampire Weekend at Huntington Bank Pavilion. Please note: The term Huntington Bank Pavilion and/or Vampire Weekend as well as all associated graphics, logos, and/or other trademarks, tradenames or copyrights are the property of the Huntington Bank Pavilion and/or Vampire Weekend and are used herein for factual descriptive purposes only. We are in no way associated with or authorized by the Huntington Bank Pavilion and/or Vampire Weekend and neither that entity nor any of its affiliates have licensed or endorsed us to sell tickets, goods and or services in conjunction with their events.